Attorney Amanda Crain’s crack legal skills and determined pursuit of justice are a perfect fit with the Halunen Law employment law team. After several years practicing family law, Amanda came to Halunen Law with an astute understanding of client emotional trauma, conflict, and complex legal matters. She loves working at a firm founded on a deep commitment to do what is right for employees facing wrongful termination, discrimination, harassment, or other illegal workplace practices. Amanda’s perceptive approach, proven record, and steadfast dedication serve her clients well. Amanda’s ambition started early. As a kid growing up in Mankato, Minnesota, the dynamic and confrontational television attorney Ben Matlock captured Amanda’s imagination. Years later an undergraduate Constitutional Law course sealed the deal. She went on to graduate from the University of St. Thomas Law School and began a promising legal career. 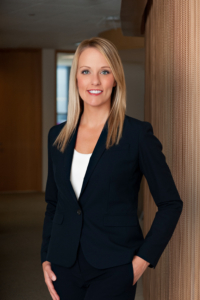 She has been selected into Minnesota Super Lawyers Rising Stars, an elite group of only 2.5% of Minnesota attorneys under the age of 40, consistently since 2014. In addition to presenting at seminars and publishing articles, Amanda mentors young law students, and participates in several professional organizations. Amanda believes that being a good lawyer requires more than an understanding of legal issues. A good lawyer is a zealous advocate, possesses good instincts, has empathy for clients, and can analyze legal issues intelligently and effectively inside and outside of a courtroom. Amanda’s approach will guide your case efficiently through the process so that you can achieve the results you deserve. A big fan of traveling and the great outdoors, Amanda has hiked the Grand Canyon, through the hills of Thailand, scaled waterfalls in Costa Rica, and traveled around Europe. When she is not at work, you will find Amanda at a yoga class, running, or preparing for her next big adventure.